Ramblings and Musings on Tabletop RPGs by an Old School Gamer. Tuesday Tales, Thursday Thoughts, & Saturday Scrawl. Just a quick update about all the happenings around Follow Me, And Die! and all it's many ventures. My YouTube series: How to AD&D 1e and Roll20 For The Absolute Beginner. My blog article with my RPG idea. Link to sign up to get an email when the card game Kickstarter is launched. My Patreon. My DriveThruRPG Publisher Page. To see all of my PDFs. After a couple of call ins on my last episode by John Payne and Jeremy "Frothsof" Smith, I discuss a bit about the time I through an unexpected NPC at the players. It's amazing how cool magic items used by NPCs bring out the envy and greed in players. John Payne's Podcast is Old Sword and his blog is Sycarion. Jeremy "Frothsof" Smith has a Podcast - Thought Eater and a Blog also Thought Eater, and a new Patreon and his Psionic Platypus zine [Affiliate Link]. You can read the companion blog article here, and see a picture of the mountaintop temple. 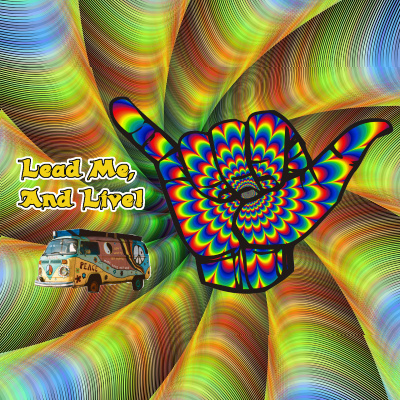 Marvelous Monday - Lead Me, And Live! Episode 99 - Thursday Thoughts - 100th Episode Retrospective. Surprise! This is actually my 100th Episode, since my first episode is Episode 0. Episode 0, Checking out Anchor, Lean Rules, and other Musings, was published on Jun 24, 2018, just over nine months ago. Flip the switch and check all my sites! You can find me online wherever you see my social media avatar, Griswald, the guy with the raised sword and wolf's head shield. Background ambiences from Tabletop Audio that I support on Patreon. Soundtracks include portions of Skirmish, Medieval Town, and Medieval Battle. A Science Fiction RPG, a Space Pirate game, and and Interplanetary War game were three home brewed games we made back in the day. I wrote something about these games on my blog a few years ago. While I'm talking about past games, I discuss my 2017 entry in the 200 Word RPG Challenge, Cat Wrangling, and ideas for making a more rounded RPG out of it, and ideas for a potential card game, and board game. You can find the 200 Word RPG Challenge here. My blog post about my 2017 entry is here. Where I discuss my call for artists for card art and announce a target date of the Kickstarter in the first quarter of 2020 for my card game. I also mention the publication of my first adventure PDF available on DriveThruRPG. See the companion blog post here. The Twitter thread where I initiated my call for artists and announced the target date. Other links mentioned in this episode: My Teespring store Kevin Crawford on DriveThruRPG [Affiliate Link], Stars Without Number [Affiliate Link], and his Kickstarter profile. Artist interviewed on Episode 86, Lindsay Poulos: Twitter, Instagram, Art Station, Deviant Art. My first adventure PDF on DriveThruRPG: No, Really, It's Me. Doppelgangers replace a party of adventurers and have to convince others not to return to the dungeon. A couple of call ins responded to my last episode about Mules In the Dungeon. I also had some comments on G+. In the waning days of G+ I still post and people respond, faithful to the end. Ramblings of a Gamer and Artist podcast and Northport Blog by Gwythaint, AKA Denis McCarthy. Denis is an artist for many products on DriveThruRPG and even has a lot of art you can use in your own publications. I've used his art in several of my PDFs. Plundergrounds podcast, Jellysaw games, and Patreon of Ray Otus. Spikepit has requested that I discuss my experiences running The Front. You can get The Front on DriveThruRPG for the PDF and on Lulu for print. I did a review of The Front on my blog back in March, 2016. The Front is based on The Black Hack 1st edition. (You can find the second edition here.) NOTE: I backed the Kickstarter for both editions of The Black Hack. If you want a more realistic WWII RPG, check out Operation Whitebox by Pete Spahn, which is based on Swords & Wizardry Whitebox PDF or on Lulu here. NOTE: All links to DriveThruRPG are Affiliate Links. I plan to make an adventure module out of the various convention games I've created and ran. I ramble on about how simpler is better in my experience and that is the goal of all my publications. I invite listeners to call in an share how their game prep for convention games compares to their regular game prep. A quick story about the recovery of a legendary suit of armor. No frogs here, so move along. My brother, whose character had this item, made this comment on the Follow Me, And Die! FB page: Hey Larry I need to tell you that you are only sort of right Yes the armor was pitch black but it was full plate. And it didn't age you but turned all of your hair completely white. It had 2 or 3 other abilities but I can't remember them and can't get to my notebook at the moment. I discuss how players in my game wanted to display the trophies of their kills. Two call ins from Jeremy at the Thought Eater podcast. He also writes the Thought Eater blog. I nearly lost this whole episode. I mis-numbered it as 87, and while I was still in Audacity, tried re-naming the files and directories. Do NOT do that! I managed to recover this episode. It isn't cut well, but after multiple trains interrupting my flow and nearly losing the whole thing from my own stupidity, I'm calling it good enough. After much reflection on my workflow, and the expense of some of my tools, combined with the looming demise of G+, I am convinced, that for me, I need to get serious about moving my workflow to Linux. Plus, dual booting a computer is like having two and is twice as much work to keep updated. You can read my companion article here on my blog. https://followmeanddie.com/2019/02/02/simpler-tools-just-as-cool/ I go into more detail and link to more information on all the things I mention. Both the podcast and blog article are quick overviews, and I may have left out some things. Please reply on Anchor or comment on the blog article to keep the conversation going. I have an Android phone which is based on linux. So I've already recorded episodes straight to my phone. Linux is based on unix Mac OS is based on unix. iPhone is also based on unix. Today on episode 75 another Tuesday Tales. Last week I discussed insanity and promised I'd tell the story of how Griswald almost died of disease, and again, another cleric had to heal him. Thanks for the call in from Shane Ward of Gilligan's Isle of ADD. I also have a new podcast follower, the Role Per Second Podcast based in Guadalara, Mexico. Welcome! ¡Bienvenidos! Today's episode of Saturday Scrawl marks the completion of a complete week of the regular Tues, Thurs., Sat. cycle. I also had a couple of extra episodes. As so many are talking about conventions they're attending and both running and playing games, I want to talk about running convention games. I also share a snippet of a story from my foggy mind as I awoke this morning. I'm not sure what I was dreaming, but I've got a great start to a short story. What do you do when life gets in the way of your hobbies? Tonight's episode is a short one as I'm just taking a quick break from an emergency project at work. I said I was back to my normal podcast schedule this week, and I'm sticking to it. We have calls ins from Tim Shorts of Gothridge Manor and Ray Otus of Plundergrounds. Yes it's the return of Tuesday Tales, where I discuss stories from Back in the Day, and sometimes things from more recent games. Today on Episode 72, I talk about the time my character Griswald, the namesake of FMAD lost his mind. ***** But first, a quick disclaimer: ***** I will mention something in this episode that some might find upsetting, so if this topic bothers you, then please don't listen. I mean no disrespect to anyone who struggles with mental illness. I encourage anyone who struggles with their mental health to consult with a mental healthcare provider. If you are struggling with thoughts of self-harm, the American Foundation for Suicide Prevention has a hotline at 800-273-8255. So far, I've had 7 call ins from three people on my episode Saturday about Dwarven Beards. I wrote a follow up blog article with more details and some tables. This morning I realized I left out some things I meant to touch on, so I've written a second blog article with some more tables. Both articles are linked below.. Rather than let this information simmer, I'm ready to respond to these call ins. You'll want to listen to episode 69 before you listen to this one. Matt Jackson is a first time caller. Ray Otus of the Plundergrounds podcast and Cody M. of the No Save For You Podcast. Check out the two blog articles I've written on the topic: Musings on Dwarven Beards and More Musings on Dwarven Beards. My granddaughter is fascinated with magic as portrayed in cartoons, like Disney's Frozen. Lately, she is hooked on magic wands. Her grandmother got her a tablet and her parents got her a dozen styluses, just in case. Today, one such stylus is her wand. I think this is a great example of role play, she is all in when it comes to being who she says she is. She likes rolling dice, but she's not quite ready for sitting still to play an RPG. She just turned four last Sunday. Episode 68 - Saturday Scrawl #12 - I'm still here. I have call ins from John Large of Red Dice Diaries, Ivy The Happy Whisk, and Cody M. of No Save For You. Today's story is about the party interrupting the wizard. Episode 64 - Saturday Scrawl #10 - Play what You've Got. Comments on the last episode about Cities as Dungeons. Today I discuss playing the games you buy and download instead of just gathering them. An interruption of the regular schedule this week. Just a quick explanation after a call in from Happy Whisk. Normal episodes will resume next week with Tuesday Tales. Episode 60 - Saturday Scrawl #9 - Hob and other names for Goblin. After call ins from Dr. Robert Groves of DM Dad https://anchor.fm/dm-dad/, and Cody M. of No Save For You https://anchor.fm/nosaveforyou/, I share a story about characters in winter and some things to consider with making the effects of weather more realistic. After some call ins, I delve into video games. I'm a gamer and I like all kinds of games, not only RPGs. Another story about Griswald, the namesake of Follow Me, And Die!, was sent undercover by the king. Since I didn't manage to do a live show from the con on Saturday, Saturday Scrawl #8 is now Monday Madness #1. I had a blast and want to encourage everyone to attend a game convention at least once. I finally located my notebook with all my past characters in it for which I still have a character sheet. Musings on languages in game and characters I don't recall. A discussion of crafting magic items and some ideas for how to make it more interesting in your games. Call in from Colin Green of Spikepit. https://anchor.fm/spikepit/. More follow up on my call in for Episode 28 of https://anchor.fm/Thedicearescreaming/ on Paladins. I struggle to do funny voices at the table. I either suffer embarrassment, or get so wrapped up in running a game, that I forget to do the voices. I discussed the mechanics of the Insect Plague on Saturday Scrawl #5 a few days ago, so this episode wouldn't be too long. Why I think it's better to give than to receive. After a call in about Alliteration as Inspiration from last episode, I discuss Insect Plague in Oe, 1e, 5e, and a few retro clones. I discuss details of the spell in preparation for the next Tuesday Tales. The Dreams in Gary’s Basement: A Documentary on Gary Gygax: Back this Kickstarter to help fund final edits for this movie. https://followmeanddie.com/2018/10/16/the-dreams-in-garys-basement/ Why The Unexpected Should Not Surprise us: Re: The DND Sports announcement. https://followmeanddie.com/2018/10/16/dnd-sports/ A call in from each of the brother's Green. And today's tale, Fasbold Torion, low charisma. A call in from Ray Otus of the Plundergrounds podcast about Saturday Scrawl #3. Today - My thoughts about moving things along when players get bogged down in discussion over simple matters or aren't ready on their turn for combat. In today's Tuesday Tales, I talk about the oldest character for whom I still have a character sheet. Kad Staglar, halfing fighter/thief. I tough on the whole end of G+, but will do a blog post and perhaps discuss it on the next Saturday Scrawl. Episode 39 - Saturday Scrawl #3 - Stretching Creativity. Stretching creativity in all ways. As a GM & Player, and through writing, drawing, and other forms of expression. First up a slew of call ins about Encumbrance from Saturday Sprawl #3. Tuesday Tales #3 will touch on several powerful magic items and the hilarity that ensued. Follow Me, And Die! - Episode 34 - Tuesday Tales #2 - REVENGE! The first Saturday Sprawl - Training and Advancement to new levels. How I've experienced it as a player and how I handle it as a DM. After a call in from Spikepit on the first Tuesday Tales, I give my take on Retainers and Hirelings. After a call in about the last episode where I interviewed my brother, Robert, I talk about the dwarf, Margus Greystone, in the first Tuesday Tales. Follow Me, And Die! Episode 30 Interview with my brother, Robert. Interview with my brother, Robert. About his upcoming YouTube channel, his book, and his opinion about my card game. I've had requests for more storied from "Back In The Day" (BITD), so I will have a Tuesday Tales episode each week until I run out of stories. Some will be of my characters, and others will be of other characters. An update on downloads of my first PDF, subscriber numbers and followers, and podcast downloads. Calls ins, and discussion of upcoming PDFs for September, and the most likely topic for October. Also a request for feedback and ideas. Some call ins and today's topic, One on one play, one player and the GM, my experiences. An update on my first PWYW PDF on OBS, growth of my various social media, a call in with congratulations, thanks, and a teaser of what's on the docket for future PWYW PDFs. Call in from Colin about Appendix N. I announce that my first PDF is live on OBS as PWYW and I launched my Patreon. A few thoughts on shopping and buying equipment. Favors as payment. NOTE: Episode 20 is delayed as it is the announcement of my PDF going lived on OBS. First time publications have a 1-5 day wait. Calls ins about last episode's (18) discussion of Appendix N. I list off several titles that make my Appendix N. I mention my first PDF for DriveThruRPG is in the works and I shared a teaser on social media of the cover. A Call in, progress on Patreon and PDF for OBS, Appendix N.
Follow Me, And Die! - Episode 17 - Rambling update. I'm still here. A very rambling episode. 6 days since last episode. Mystery of delay on Apple Podcasts solved. Job and other commitments sapping creativity. Power Outage Kickstarter for kids RPG has funded, last few days to work on stretch goals. Two call ins and my responses. Lots of activity getting things ready to launch my Patreon and publish my first PDF on OBS. I also launched my t-shirt design at TeeSpring. 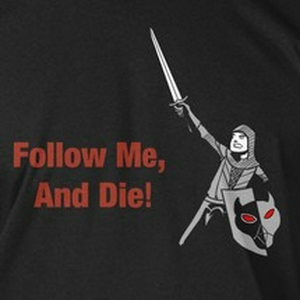 Follow Me, And Die! - Episode 15 - There is more than one way to run an RPG. There is more than one way to run an RPG. A serendipitous response to a Twitter comment. The way Matthew Mercer GMs Critical Role is not the only way to do it. Players should run games and play with other GMs. GMs should run games for different players, and also play games. The podcast is doing well, over 325 plays of all combined episodes, some over 30 and nearly all over 20 plays. 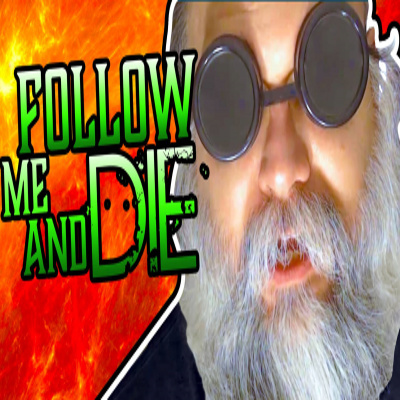 I launched Follow Me, And Die! Entertainment LLC and got the documents in email today. Finally, I discuss some thoughts on making my own RPG and mention possible genres. I mention my upcoming blog post on GM minimalism at the table. A song on the radio inspires ideas for monsters. I discuss more of my creative process and walk the listener through how I did it. The companion blog article will be up in a day or two and will feature some stats to go along with the ideas. Call ins galore! Today's Topic - Trust the GM and be an ambassador for your table and all role players. Episode 10 of the Podcast. AD&D leads to rules lawyering. Simpler systems or a document to explain rules not used, modified, and RAW. Calls ins from Colin Green/Spikepit and Shane Ward/Gilligan's Island of ADD. New from WOTC about two new settings, one coming in November and the other one on GMs Guild. This week is Read an RPG Book in public The Escapist/RPG Advocate. Finally, the game store I mentioned when I called into Radio Grognard with Glen Halstrom. An Anchor website/app rant. A bit of how I record and upload to Anchor. I recorded and edited this episode in about 15 minutes after taking 10 to dash out a script. I also didn't edit as tightly as I could. Colin Green/Spikepit calls in. I finally figured out what to do for Patreon and am making preparations to launch a Patreon in the coming weeks. Follow Me, And Die! - Episode 6 - OSR Crowdsoured The Black Isle Released! The OSR Crowdsourced Black Isle was released yesterday on the 9th anniversary of the blog. And our second call in to the show from Spikepit. Thoughts on the cleric spell Command in AD&D in English and other languages. Thoughts and ideas for the Chant spell. Out of the box thinking for making all spells useful in the situations characters find themselves. First message on the podcast! Thanks for the encouragement. Today - how to avoid D&D on the brain when devising your own RPG? Fumbles In Pronunciation - Words from AD&D 1st Edition that we struggled with back in the day. Some, especially one, I still struggle with. I Need A Table - Tables seem to be one of the iconic things about the OSR, various creators sharing their tables. I have a few I have made, I like all the dice tables and die drop tables. I have nebulous ideas for a table or set of tables I need. I discuss top down and bottom up world building, with a focus on bottom up as it gets one to running the game sooner. Introduction, OSR, Lean Rules, creaking chair, and interruption by the train. This was off the top of my head without a script, so as with many other OSR podcasters on Anchor, I ramble. If you like what I have to say and want to touch in more detail on a topic, let me know.